The Jewish Leadership Blog: "Because of Groundless Hatred"
The Sages ask the following question: If, as we know, during the period of the Second Commonwealth, Jews busied themselves studying Torah, doing Mitzvoth, and performing acts of kindness, why was the Holy Temple destroyed? Answer: Because of groundless hatred. Yet, what sort of senseless hatred could possibly have been practiced by people who busied themselves studying Torah, doing Mitzvoth and performing acts of kindness? How is it possible that people of such commendable fiber could have allowed themselves to be caught up in blind animosity - what our sages refer to as "Sinat Chinam"? It appears that this hatred evolved precisely upon the background of the praiseworthy acts that they were so adamant about performing. The period of the end of the Second Commonwealth runs parallel to the appearance of a fiery debate in the field of Jewish law. According to our sages, this controversy began to develop in the time of the early Mishnaic masters known as "the Pairs", and reached its height with the flowering of the Schools of Hillel and Shamai. Though it began as a legitimate debate, a sincere attempt to clarify the truth, untainted by trivial contention - it appears to have eventually seeped into areas unrelated to the actual laws at question. 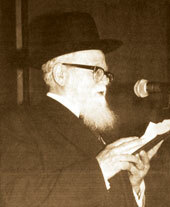 The Schools of Hillel and Shamai debated for three years. One side exclaimed, "The law is as we say." The other side responded, "The law is as we say." A heavenly voice called out: "Both are the words of the living God, and the law is according to the School of Hillel." The Sages explain the reason for this: "Because they (the disciples of Hillel) were peaceful and humble and would study the words of the School of Shamai. What's more, they would bring the opinion of the School of Shamai before their own." From the behavior of Hillel we are able draw our own conclusion regarding that of Shamai. Here, then, we find the Sages voicing implied criticism of the nature in which the students of Shamai handled themselves. Their fault lay in the fact that they demonstrated a lack of tolerance toward opposing opinion and a lack of respect for their fellow scholars. True, the mere existence of such discrepancy - one side forbidding, the other permitting; one side declaring "impure," the other declaring "pure" - evidenced a decline in Torah knowledge. True, in previous generations there had existed no such discrepancies. Nevertheless, the disciples of Shamai ought to have kept in mind the fact that their opponents, no less that they, possessed the right to weigh, judge, and establish rulings according to what seem correct in their eyes. Even if one is convinced, beyond all doubt, that his opponent is mistaken, he is obligated to respect the other's opinion, for he too believes that the truth is with him. One who is overly adamant in arguing the correctness of his opinion, one who disgraces his opponent because he holds differently, one who refuses to confine conflict to that arena alone which is absolutely necessary - sows seeds of hatred and contention. This sort of individual will eventually be led to defend his position by using any means possible, until finally he causes a complete severance between the debating camps. In the end, there remains no way of uniting them; neither are they able to work together towards a common goal. This situation eventually results in destruction, and this is the sort of groundless hatred that led to the destruction of the Second Temple. The appearance of differing opinions resulting from differing understandings of the Torah and its commandments has always been legitimate, and these sorts of differences characterize our times as well. The way of interpreting recent events in Jewish history, how to relate to the modern State of Israel, the methods used in order to attain goals - all of these issues are subject to conflicting opinions between the national-religious camp, and those who claim that for them there is "nothing besides the Torah." Were the debate confined to these issues alone, it would be possible to consider its existence a healthy one. This is exactly the problem. Even our camp is sometimes guilty of allowing things to spread far beyond the boarders of true and legitimate debate of opinion. Let these "Yemei Bein HaMeitzarim" - the days leading up to the ninth of Av, days of the destruction of the Temple which remind us of the iniquities of our ancestors - serve as a warning to us not to become entangled in that very same poisonous sin, the sin which caused the destruction of the Second Temple - that of groundless hatred.